Wearing my new linen/silk blend sweater to a book reading with my @dearestlizzie. Feeling *extremely* Chicos with all the drape 😅. 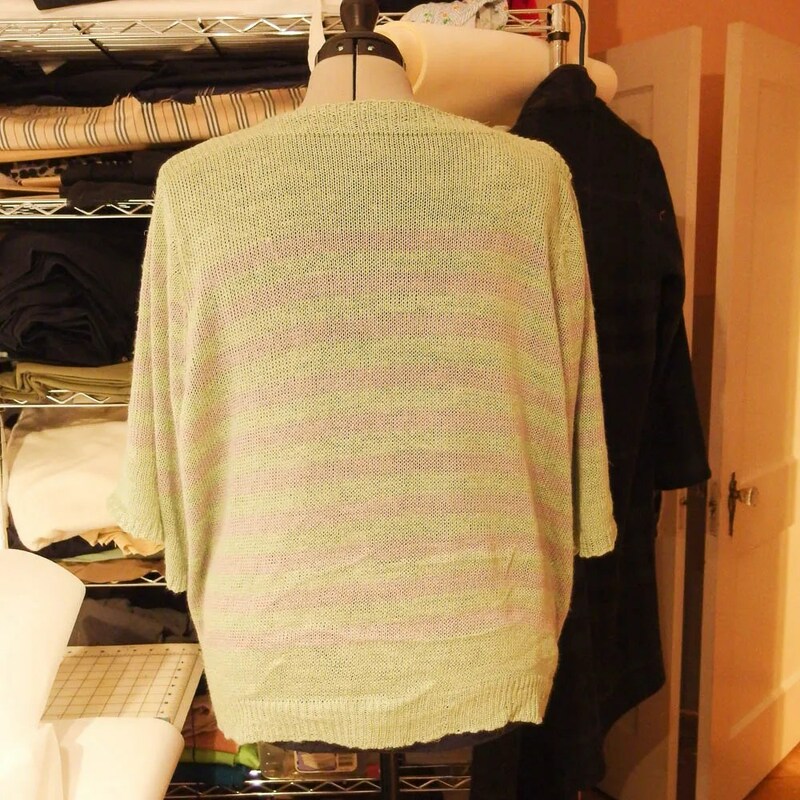 Way back in May I decided to knit a summer sweater based on the Carmel sweater by Isabell Kraemer. 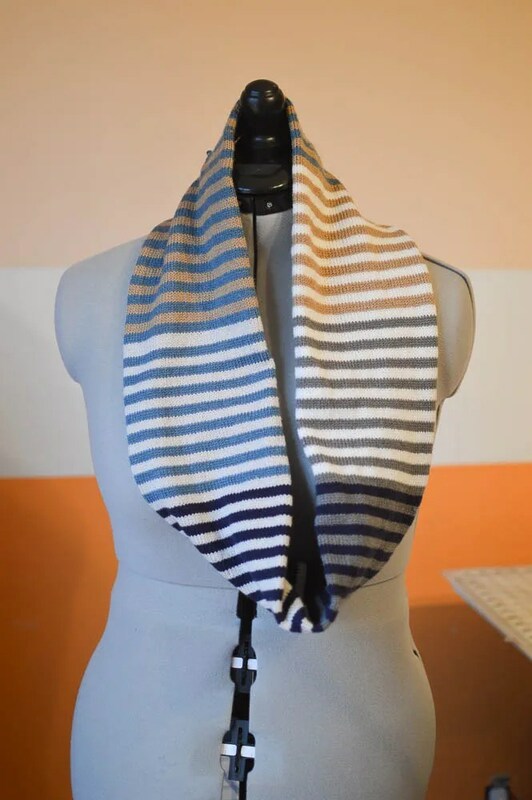 I love most anything with stripes and decided to make this my third knit garment. 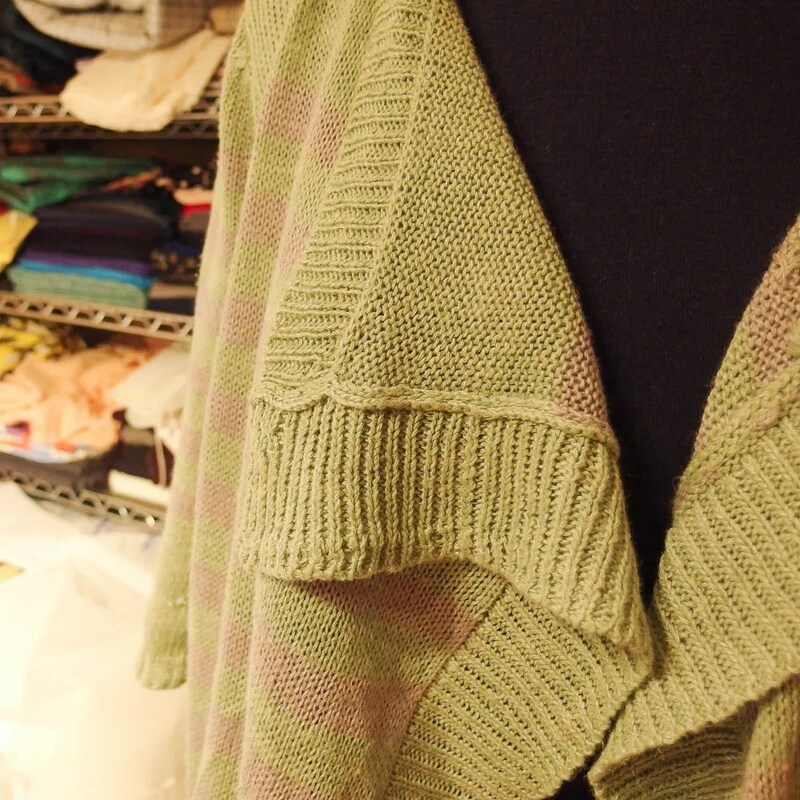 It’s been knit over 1900 times! Over the summer it became a UFO when I was short green yarn and needed to order more. And, then I was entirely distracted sewing tee shirts and work out pants. Now, at the beginning of fall, I decided to pick it back up again. 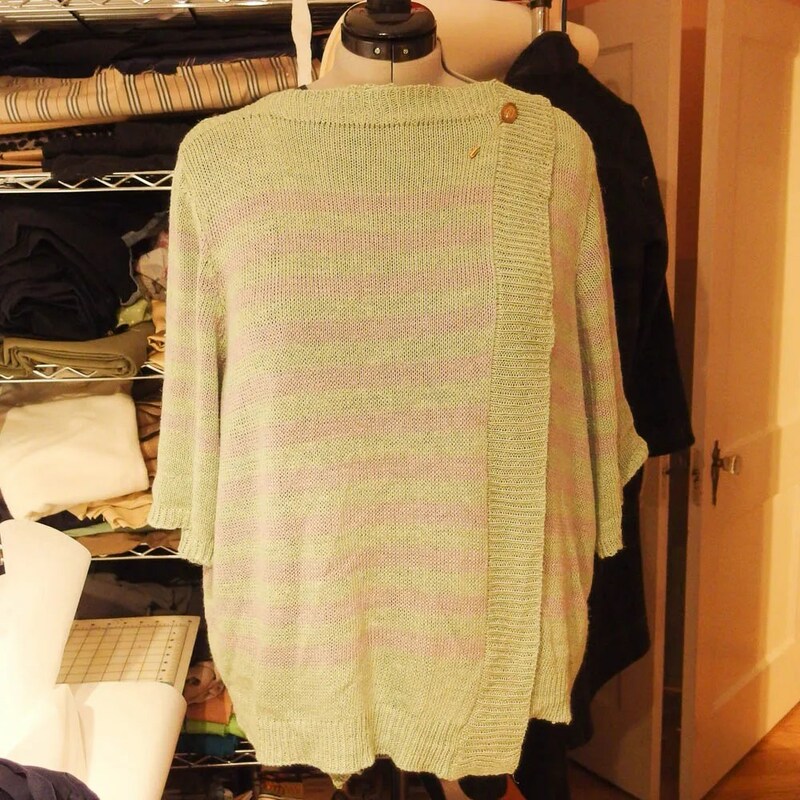 It’s a ‘summer’ sweater because the yarn is a DK weight, linen/ silk blend from Colourmart and provides zero warmth. 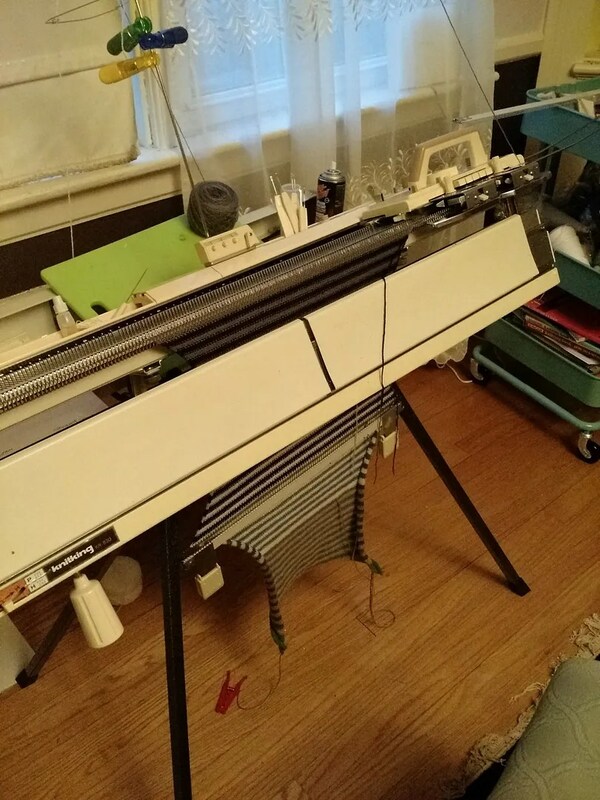 I knit all of it including the ribbing on my Brother 830, a standard bed knitting machine. The Carmel pattern is a written pattern (no schematic) only. And, I don’t really read knitting. So, I made a bunch of guesses about the dimensions and drafted away in Garment Designer. 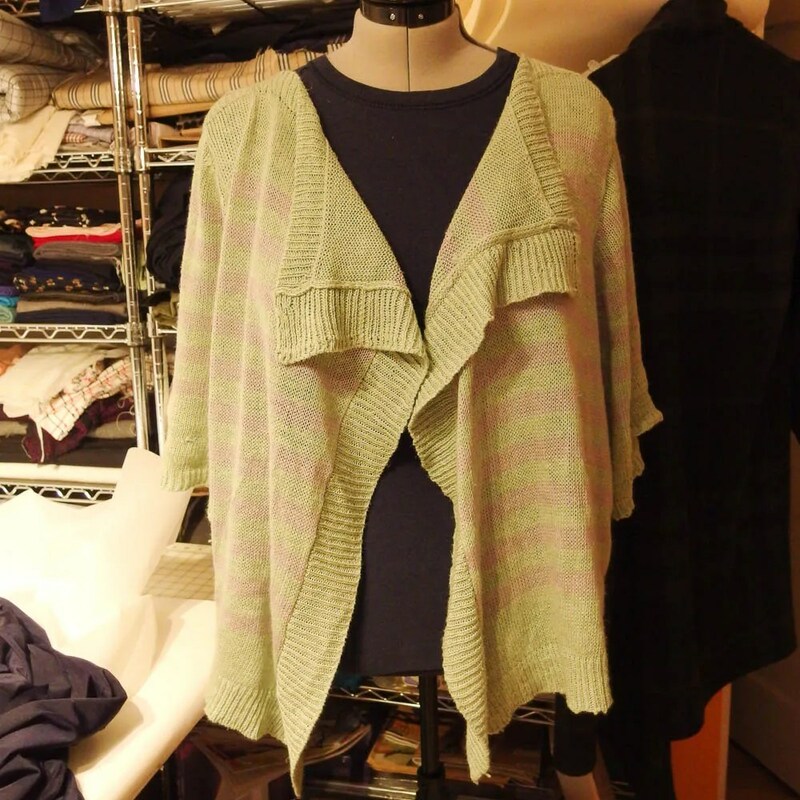 For this, I went with the cardigan in a basic shape, boat neckline and 3/4 tapered sleeves. 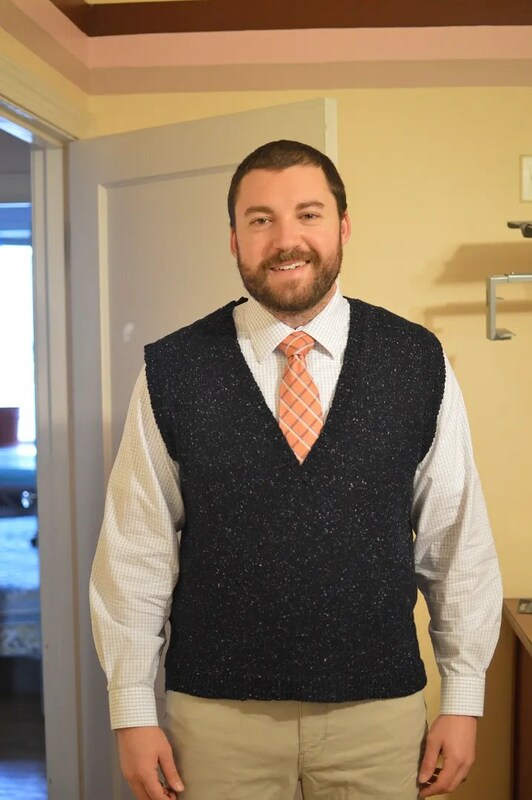 If I were to knit it again, I would knit a round neckline, contoured (more fitted) bodice, raise the armhole and keep the sleeves and length as originally drafted. I’d also pick colors with a higher contrast. The colors here are fine. But, I’d love something with a bit more contrast. I really learned a lot from knitting this. I had to figure out where my color changes would be, picking the right tension for the ribbing, using my linker to seam the garment and just how very much I hate weaving in ends. I borrowed this hat pin from my friend Liz. And, will be on the lookout for some of my own! My next knitting project is the Corvid Coat from Brooklyn Tweed. I’ve already started it on my bulky knitting machine using a sport weight yarn I bought a Maryland Sheep and Wool. Maybe I can get this one done while it’s still fall! 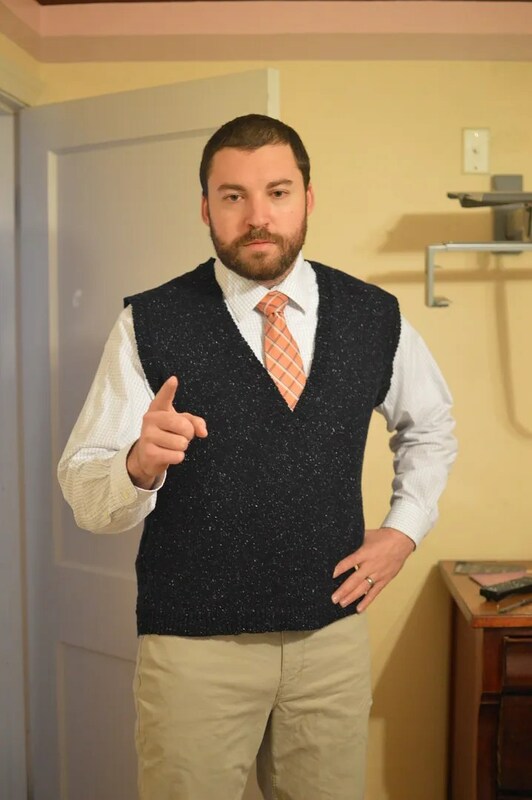 Today I present my very fist machine knit garment: a men’s sleeveless pullover. Now, I know this is like the least exciting thing in the world to knit. But, I wanted to make something for Jordan as a thank you for turning our dining room into a knitting room. It came out so well! I. Can’t. Even. The inspiration for this pattern is from a 1969 machine knitting magazine. 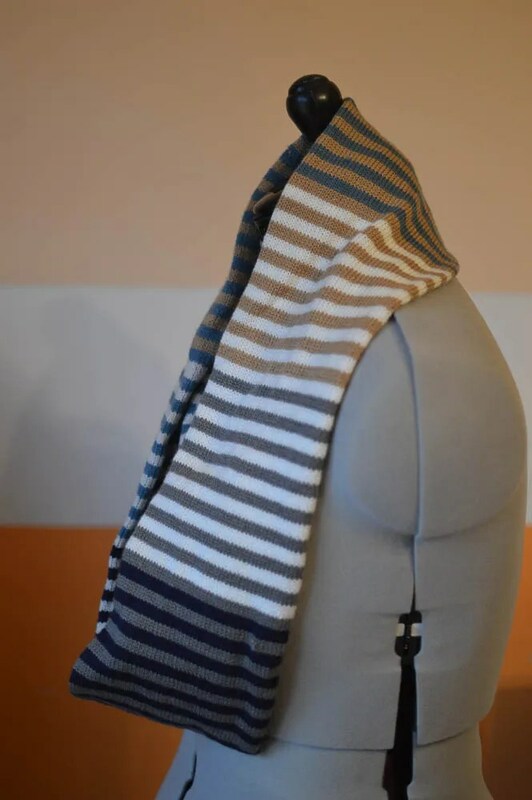 It was a good first project as I got to work increases and decreases, binding off for shaping, ribbing bands and seaming the garment on the knitting machine. 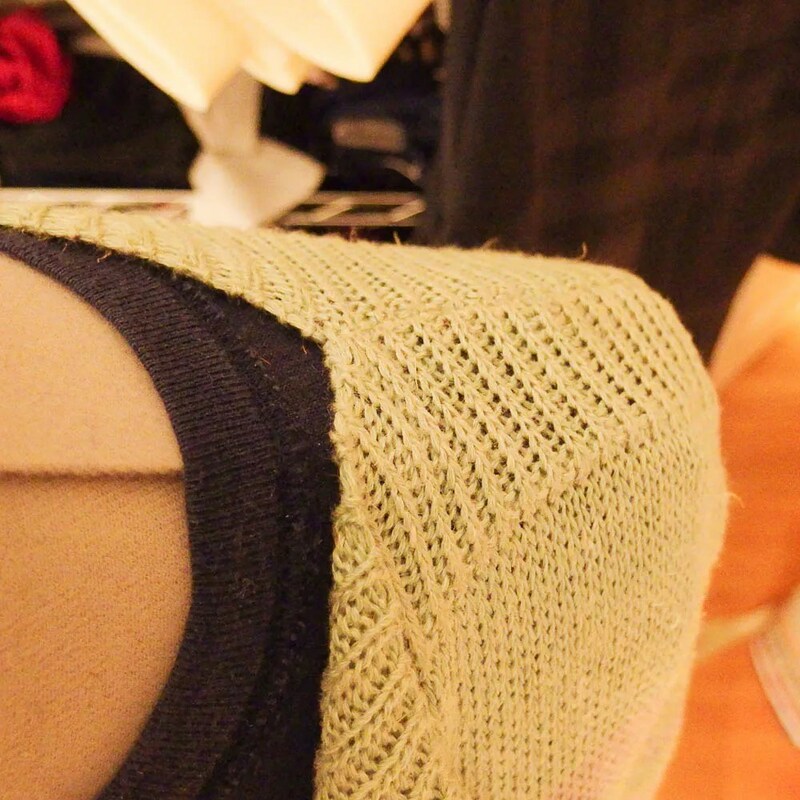 Yes, you read that right: I can even seam the garment on a knitting machine. I can’t take all the credit for this, blog reader Jeannie hooked a sister up. Turns out she’s an avid machine knitter and lives just three miles from my house. When operator error prevented me from getting anywhere near gauge, she told me to come on over. Do you know how incredible it is to find a machine knitter in biking distance???? 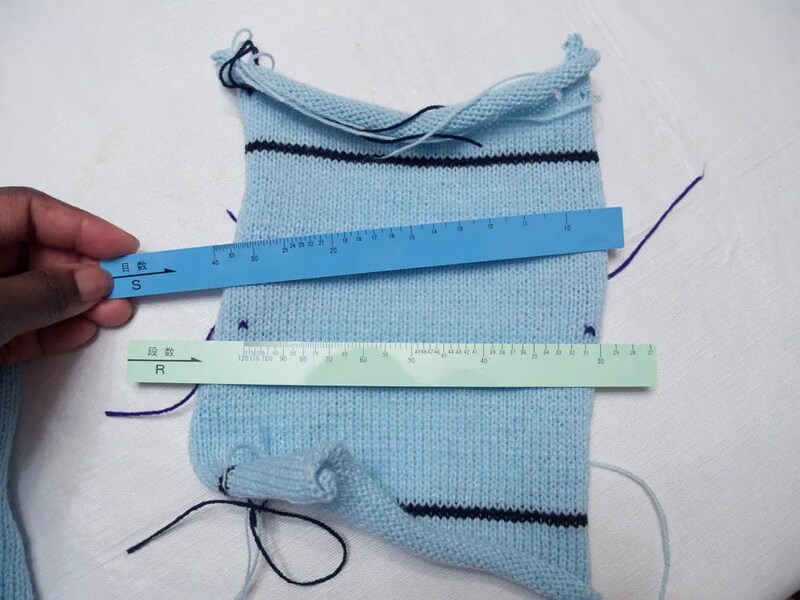 She showed me how to measure more accurately and how to use Design A Knit software to tweak the pattern. I told Jordan to pose like a 1960s dad. He clearly went the authoritarian route. DAK is MAGIC. While I loved DAK, it was too rich for my blood and isn’t native to Apple (that said, I did use VMware to create a Windows environment and run a demo version on my iMac). 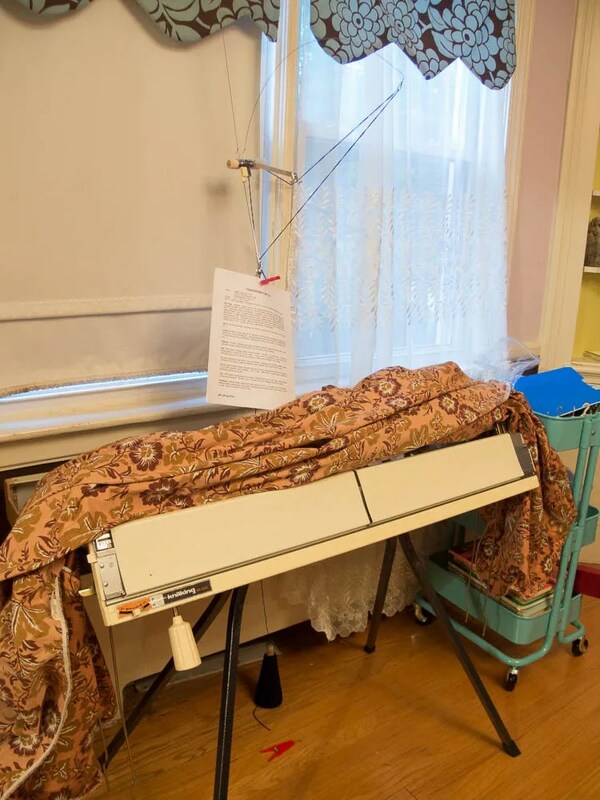 But, I also don’t have a laptop which would make the in screen knitting much more user friendly. So, for a birthday gift to myself, I bought Garment Designer which also drafts for sewing patterns. More on that in an upcoming post (although, I seem to be a liar about things I’m going to blog about so please don’t commit this to memory). I used a wonderful cashmere/merino/silk blend 4 ply yarn from Colourmart. It’s an inky navy blue with flecks of baby blue and white. The color name is Galaxy. And, the resulting fabric really does look like a night sky full of stars. The shoulders (as drafted) are a little wide for modern times and the V came out three inches longer than drafted too. 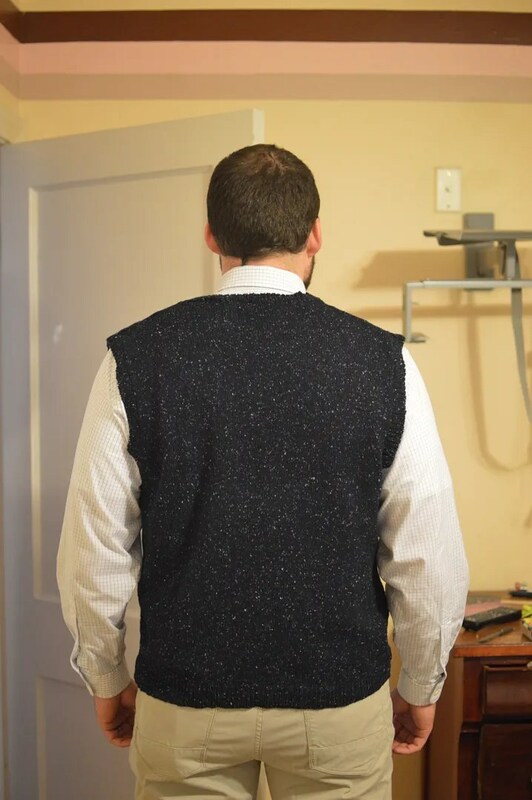 Jordan’s also much broader at the shoulder/ back area than through the torso so I’ll have to accommodate for that the next time. End result, a not terrible vest for Jordan. I need to get better about my finishing and weaving in ends (I have a sewing mentality of just knotting things off. 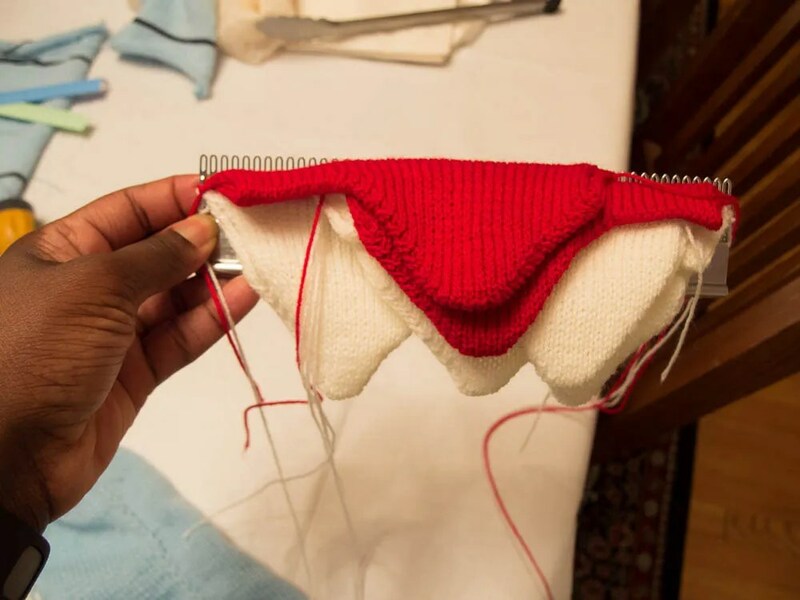 Doesn’t work the same…) I think I’m going to knit the same pattern in a 40 chest for my dad with my leftover yarn. This time, I’ll try some new techniques like short rows for the shoulder seams. Boring, long and droning Ravely notes here. I’m heading to Bali, Indonesia with a friend in less than two weeks. She’s going to Nusa Dua for work. I’m along for the ride and paid-for hotel room. Jordan will be in trial so I think he’s relieved I’ll be out of his hair. Among the activities I’ve planned for myself, I’m most excited about an all day textile tour. Bali is home to batik, ikat and what we know as Dutch Wax Prints. It’ll probably rain most of the time I’m there. But, as long as I don’t get malaria or Hep A, I can’t say that I care. I have a few things I’d like to sew before the trip (rash guard, swim skirt, rain bonnet). But, let’s face it. I’m not sewing much of anything these days. So, I won’t bore you with my whimsical ideas and will *maybe* have something to show from exotic locales when I’m home. Any Bali tips for me? I’m going to take a cooking class, a surfing class and a spa day. We’ll also be doing some biking when she’s done working at the end of the trip. Any fabric store I won’t be able to resist? Tips on bargaining and what I should pay? Give me all the tips, please. An Australian in my office told me to not act like a Bogan. That was his big tip <– If this is an offensive phrase, please tell me *now*. In other sewing news, my most made pattern, the OOP Hot Patterns Cosmopolitan dress is going to have a limited 100 pattern reprint. You may recall that I have the silk jersey pre-treated and waiting for me to make this for the fourth? Fifth time? Reasons I love this pattern: minimal if any FBA needed, defined waist, great neckline for me… it’s the ultimate dress for an hourglass. 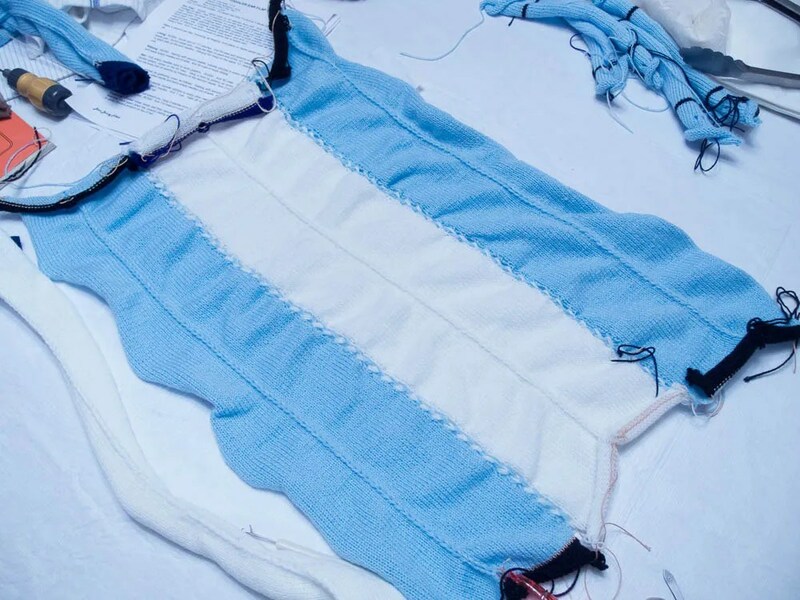 Remember the thrill of your first sewn project? It’s been a good 25 years since I’ve felt that. 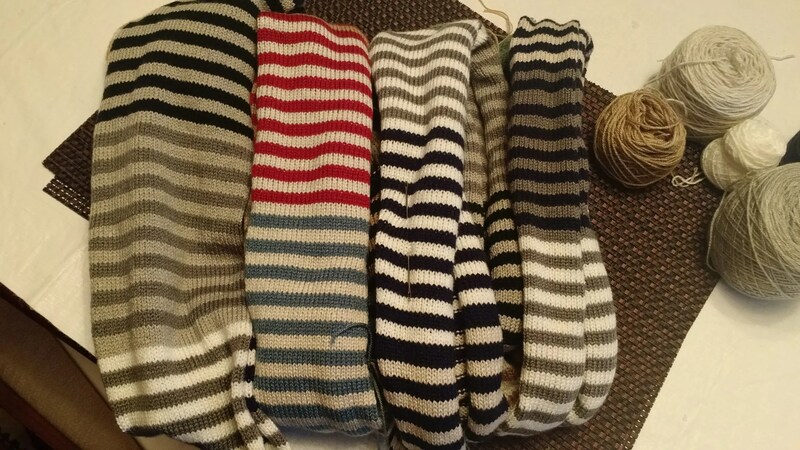 But, with the completion of four scarves on my knitting machine, I’m feeling that same level of excitement. I spent Thanksgiving this year with my inlaws on Maryland’s Eastern Shore. Hanukkah is next week so they decided we’d all exchange gifts early while everyone was together. All this is at the expense of Jordan. Because, he’s not getting squat until Christmas. I need those extra three weeks! This year I decided to knit all the women in his family Amy Miller’s Rayures Scarf. 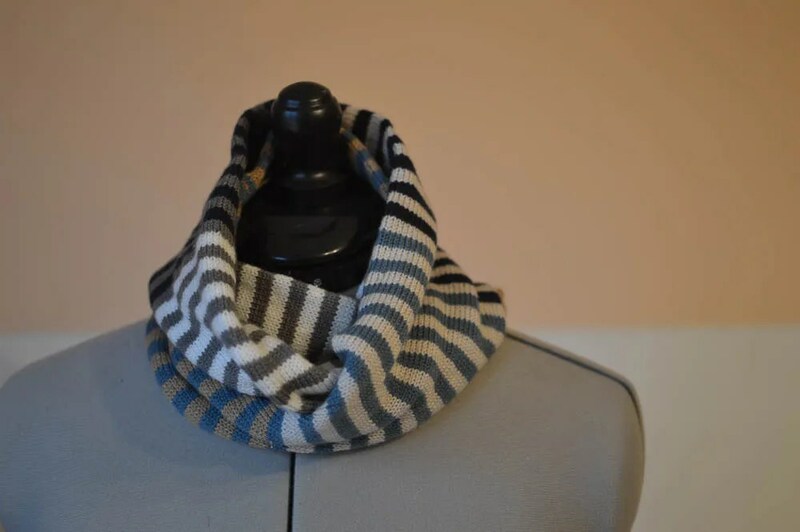 It’s a hand knit scarf pattern of simple stripes, made up in the round in stockinette. 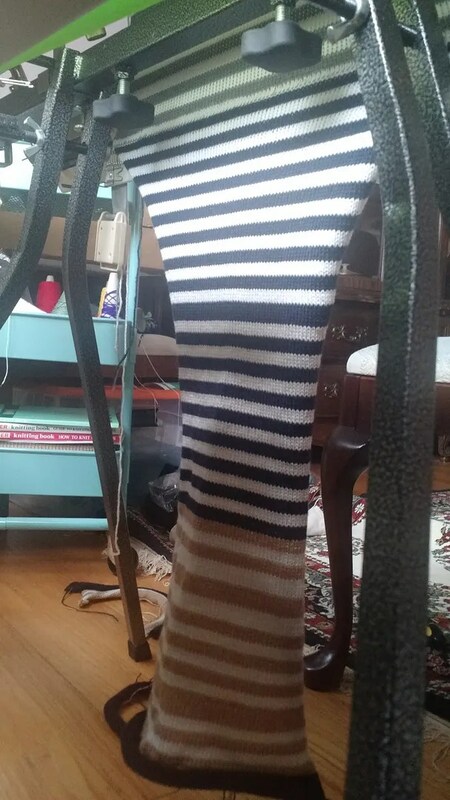 Since stockinette is almost all I can manage on my machine, I thought it would be the perfect project. 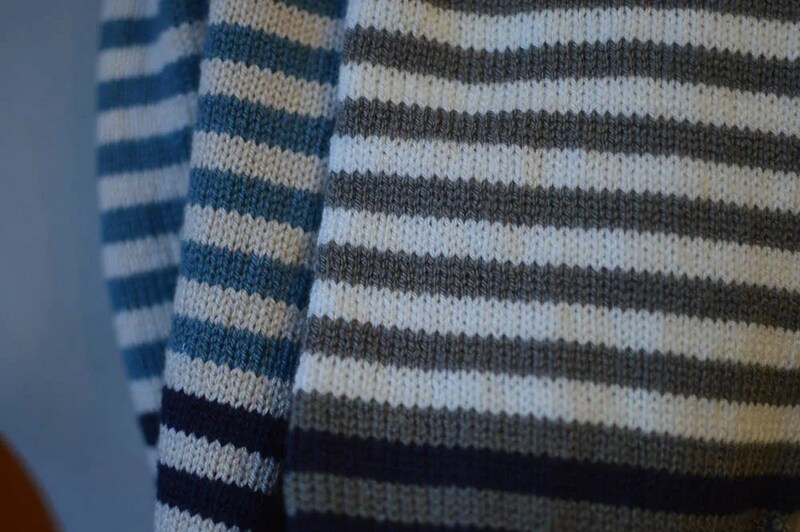 While a great project, the scarves themselves are rife with mistakes (too may rows mostly and horrible grafting). But, I AM SO PROUD OF MYSELF. I ended up making four for Jordan’s two aunts, grandmother and mom. All were basically neutral with some pops of color depending on the relative. I’ve posted my Ravelry notes for the project. And, in even writing up my notes realized I don’t even know the language of knitting. Because I’m a beginner and super prone to mistakes (and ‘good’ yarn is expensive), I stuck with an acrylic / nylon yarn from Michaels called ‘Woolike’ by Loops and Threads. It was GREAT for my standard gauge machine and very affordable — especially when on sale and ordered online. We are with my family next year, and I have four aunts on my mom’s side. So, I’ll be knitting something for them. Maybe by then I’ll be able to make up matching hats too! Knitting itself was probably about 45 minutes for each scarf. But, finishing by hand was easily another two hours for me. I am super super slow with hand techniques. And, I spent a lot of time googling ‘kitchener’ ‘grafting’ and ‘seaming’. Any who. I haven’t taken an in-person machine knitting class in several months due to my work and life schedule. But, I have been watching bits and pieces of Susan Guaglimi’s machine knitting class on Craftsy. And, it absolutely gave me the confidence to tackle this. 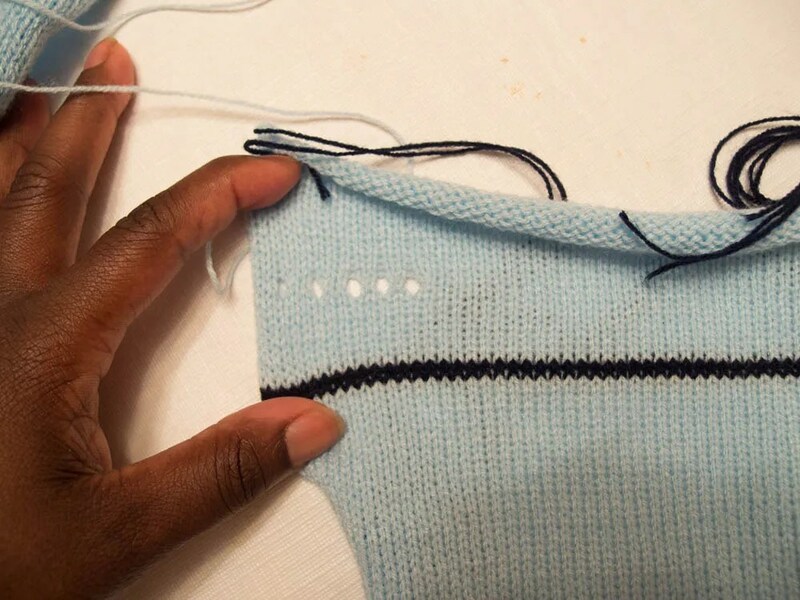 The class walks you through the basics of your machine, getting started knitting, understanding how the machine works, changing colors, short rowing, increases and decreases, making patterns / design manually and knitting your first project: a baby sweater. While I haven’t finished the course yet, I have nothing but extremely positive things to say. If you have a machine, I highly recommend you take the course. If you don’t have a machine but are curious about how they work, this really shows you. And, don’t worry about the kind of machine you have. She uses a plastic bed mid-gauge and 80 percent translates easily to my metal bed machine. I can’t wait to make my own scarf! 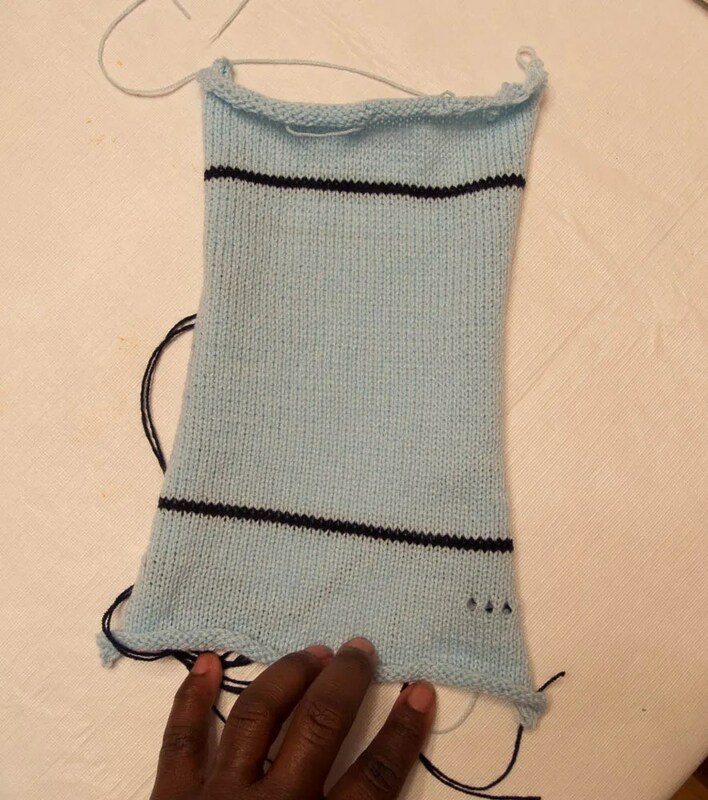 I remember how I used to barely skim knitting posts on my favorite blogs. And, here I am writing posts on machine knitting. Due to travels on my end and my instructor, Linda’s, it was almost a month between my first and second machine knitting lesson. My first homework assignment was to complete four panels of this baby blanket. I’m only using coned acrylic yarn at this point. No need to break out the good stuff when I’m learning. I’ve also tried to keep my yarns updated on Ravelry. Which is easy when you have all of four cones… I managed to finish each panel and am now latching them together to form the blanket. After I latch them, we’ll do some kind of trim along the outside, wash and block. This was going to Linus originally. But, I’ve put so much work into it I think I’ll give to my friend Elise who is due for a baby this fall. Lesson #2 was a week ago Saturday and we focused on making swatches. After a month long break, I was so excited for my upcoming lesson that Jordan said I was like a kid waiting for Santa on Christmas. 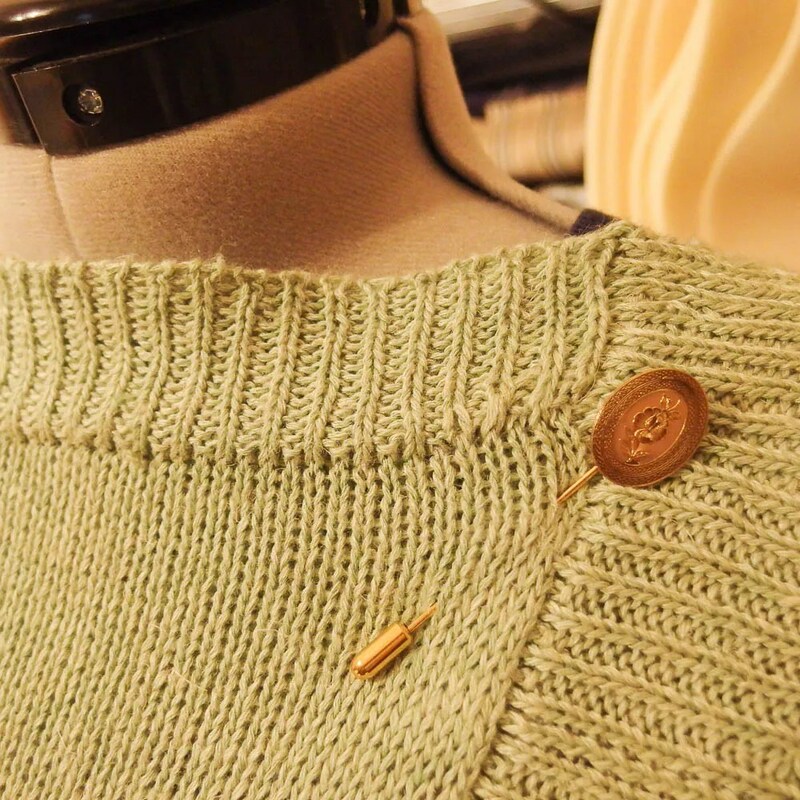 Swatching with the machine means marking the gauge swatch with eyelets to know what tension you have the machine set with. You also use these little thread markers (below) to tell you where you’re measuring in between. Finally, you use these rulers (different colored for standard vs bulky machines) to get your swatch measurements. Luckily, my third lesson was a week later as I needed (A LOT of) help learning how to pick up dropped stitches. And, I started my second project, a toddler cap with ear flaps. We make everything kid-sized as I can learn the techniques on a smaller scale. Here, I’ve made three sets of ear flaps. I actually will likely make a fourth. So, pretty much everyone who has a toddler I know is getting a hat next month. You guys. I made ear flaps!!!!! 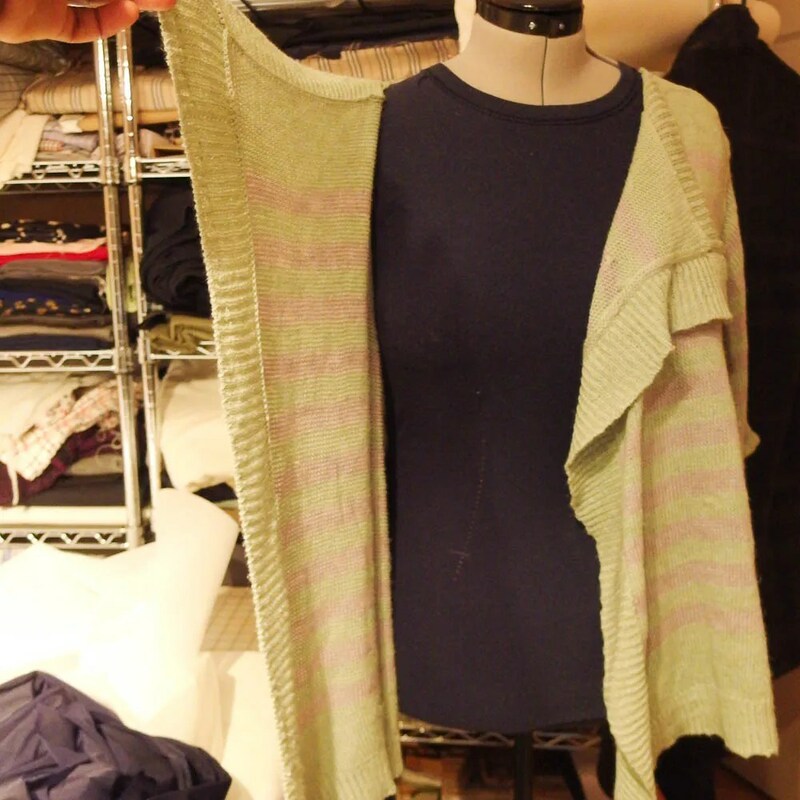 To make the flaps, I learned how to short row on the machine and hang a hem. My next lesson is in two weeks and I’ll make the i-cord and the main crown for the hat. It’s all very exciting! Also, I put the ribber attachment onto my machine (the main bed does stockinette). I have no idea how it works really. But, I figured it was time to take it off the floor. And, don’t you love my fancy machine cover? It’s an old Calvin Klein double sheet from the 90s that my mom gave me new in package when I bought my house. She was the queen of not using nice things. By the time I got it, 10 years after purchase, the elastic had already failed. My friend Sheryl asked me if I like machine knitting. Right now, I find it really interesting. It’s a whole new skill set. And, it’s weird to not know what I’m doing or understand the language of knitting (or machine knitting). But, I like what I’m doing so far. But, totally understand I have a long way to go. In other non sewing / knititng new, Jordan was sworn onto the Federal bar last week. 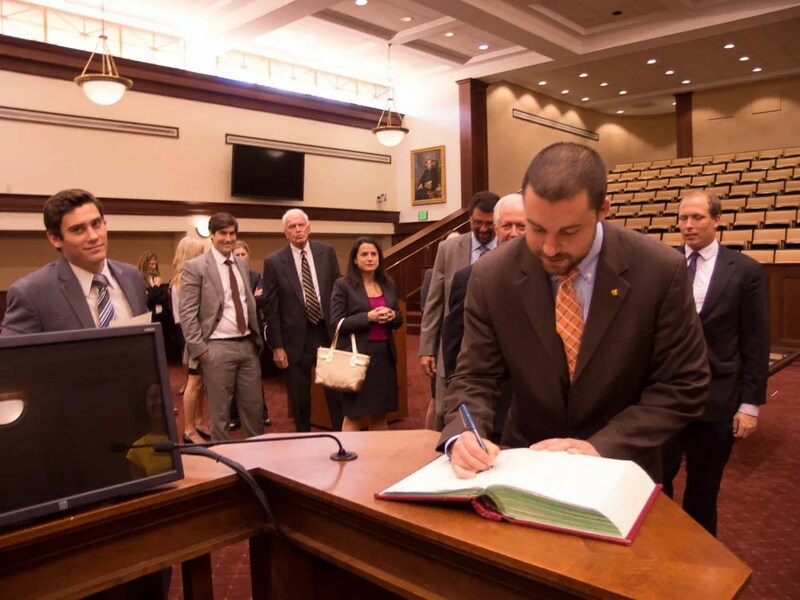 He was sworn onto the Maryland bar two years ago. But, this means he can now argue in Federal court. I just like this photo because the judge’s clerk is throwing so much shade at me for taking photos. Whatevs.